Make a great first impression with Soft Strike™ Stamping Blanks. Impress every detail of the most intricate metal stamp with just one tap. •Dimensions: 1 1/2" x 3/8"
The rectangle stamped with the word LOVE is an example. It was stamped with Upper Case Jeannie, a 4mm font from ImpressArt. 1 1/4 Inch Washers, Round Stamping Blanks, Copper or Aluminum, Set of 4, Ready to Ship! 16G Aluminum Disc, 3/4 Inch Diameter, Soft Strike Aluminum Stamping Blanks, You get 6, Ready to Ship! 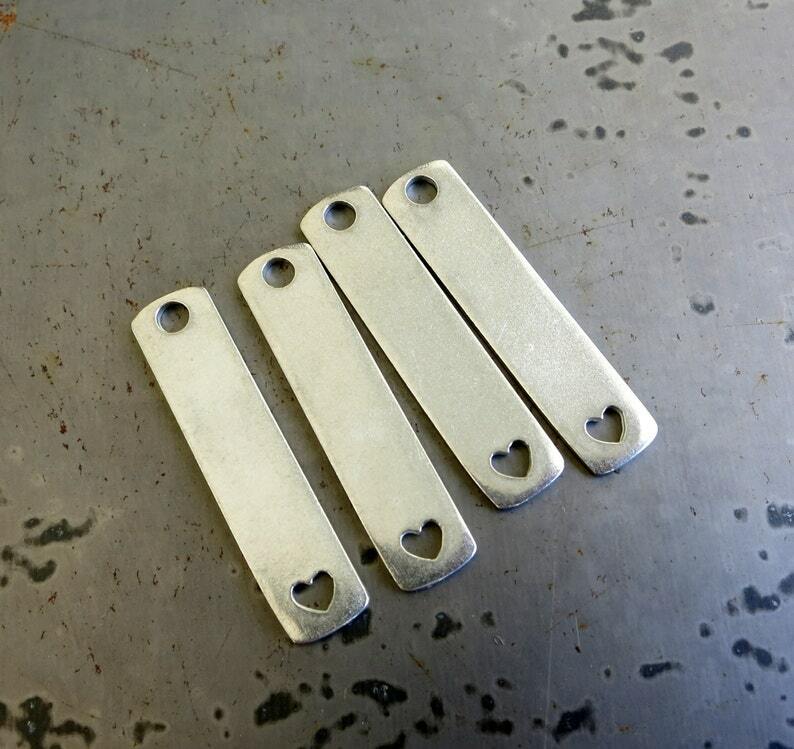 6 Aluminum Hearts with Ring, 7/8" Heart Blanks for Stamping, 20 gauge aluminum, Ready to Ship! Very nice quality, would buy again. Love working with Gail!! Always helpful & Ships super fast. Thank you !! 16G Aluminum Disc, 1 1/4 Inch Diameter, Premium ImpressArt Soft Strike Aluminum Stamping Blanks, You get 4, Ready to Ship! 1 1/4 Inch Brass Washers, Round Stamping Blanks, Set of 4, Ready to Ship! Aluminum Oval Tags, 20G Aluminum Stamping Blanks, 5/8 x 1/4", Set of 12, Ready to Ship! 3/4 Inch Aluminum Disc Blanks, 20 Gauge Round Stamping Blanks, Qty 6, Ready to Ship!